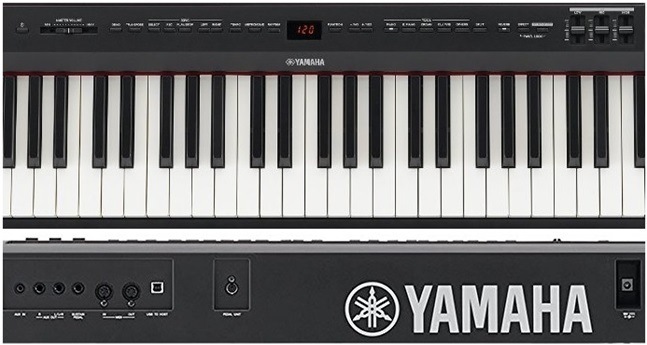 Yamaha P-255 Review - Is this piano any good for you? If you want a good piano, Yamaha is a brand that you can trust. Still, you should never buy a product sight unseen. That is the precise reason why you need a good, honest, Yamaha P-255 review. The good news is that we have one for you right here. We took a close look at the instrument that we will be explaining today. Our goal is always to help connect readers with the information we know musicians care about. From sound quality to keys, to features, we studied it all. Everything that we found is explained in the review below. Read on! If you are going to drop some serious money on an instrument, you should know everything. That in mind, read on for some important features that will inform your buying decision. Yamaha usually makes a pretty good keyboard, but this one was better than most that we have seen. As one would imagine, it is weighted, graded, and touch sensitive. The weight means that it is going to feel quite a bit like playing on an acoustic. This means that different keys offer different levels of resistance. In other words, a low note will weigh more than a high one. Touch sensitivity means that the keys will register soft and hard playing differently. Basic as this feature sounds, it is often overlooked in electric keyboards. Last but not least, the keyboard is completed with a synthetic ivory covering. One of the most common complaints about electric keyboard keys is that the feel plasticky. Though the synthetic ivory is not going to feel exactly like the real thing, it does come satisfyingly close. One of the main objectives of any electric keyboard should be to feel as close as possible to the real thing. To that end, the P225 is very successful. Another nice thing about the P255 is that it is very portable. The keyboard features a conservative weight and dimensions that shouldn’t’ be too cumbersome. This is a particularly nice feature for traveling musicians. If you are the type of pianist that plays gigs, this keyboard will be a suitable option for your performances. Phone connectivity is a feature that has become ubiquitous. Not just with pianos but with everything. Toothbrushes, microwaves. You name it and your phone will be able to hook up to it. The P255 has definitely embraced this trend. It features an IOS app that will allow you to sync up with your iPhone. The app allows you to easily navigate the interface of your keyboard. You don’t actually need to use it if you do not want to. All of the capabilities of the P255 are also accessible via the onboard controls. The app interface simply lays out the information in an easily consumed format. It provides visual cues on features that you might not have even known that the P255 was capable of. The only downside is that the keyboard is currently only IOS capable. This means that if you don’t have an iPhone or other IOS device, you will be out of luck. Last but not least, you also get a variety of sound options to choose from. The voice range selection on this unit features twenty-five different options. This range includes a variety of instruments as well as different piano tones. There are definitely keyboards out there that have more tones than this. Still, with twenty-five options, you should have no trouble finding something that you like. You might notice the first issue before you ever touch, or even see the keyboard. Price. Though this Yamaha is not tipping the scales, it does feature a price tag that won’t jive with restrictive budgets. If you have been a part of the world of pianos for some time, you may not be too concerned with the cost of the P255. Relative to some of the top-tier options out there, it may even seem affordable. Regardless, the price of this instrument does make it a choice that won’t be friendly to beginners. This is especially true when you factor in that the package does not include a stand or bench. Moving on from cost, we found most other areas of the keyboard to be free of issues. We did, however, find that the onboard speakers were not extremely loud. Ultimately, how you perceive this matter will depend on how you intend to use the keyboard. If you are planning on using it for performances, you will probably need some external speakers. But then that is usually the case anyway. If you are only using the keyboard at home, the matter of volume should be mostly fine. Though the speakers are not the best we have seen, their deficits are not so bad that most would consider it a deal breaker. These things aside, we really liked the Yamaha P255. We are almost done. Which also means that you have almost reached the point where you might want to make a buying decision. Since there was a lot of information given today, it may help to review the facts. That in mind, read on for a distilled version of this instrument’s pros and cons. You’ve reached the end of our review. As you probably gathered from reading this, we think this is a really great instrument. The price tag will probably be a turn off to beginners and budget buyers. However, the experienced musician that prioritizes quality has plenty to like. This feature-rich keyboard plays great, and does exactly what you need it to. It’s portable, IOS compatible (because everything is these days) and it is perfect for practice or for gigs. These things considered we think it is a keyboard that most will really like.